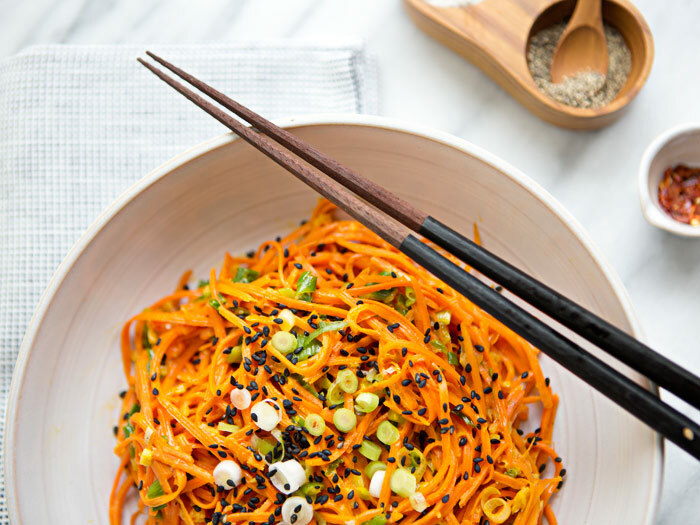 – Using a julienne peeler (the greatest tool known to mankind) peel your carrots into noodles and set aside. – In a small mixing bowl combine peanut butter, Ponzu, maple syrup, 1/2 of minced garlic and a pinch of salt. Add water, one tablespoon at a time, to thin the sauce (I used 4 tablespoons). Add more salt to taste, adjust maple syrup amount to your taste preference as well. Set aside. – Saute remaining garlic and ginger in sesame oil over medium-low heat for two minutes. – Add green onion and sauté until slightly softened, stirring often to make sure the garlic and ginger don’t burn. – Add peanut sauce. This recipe makes more than enough peanut sauce for my preference, but you know, different strokes for different folks, so add as much as you like and thoroughly combine. Garnish with thinly slices green onions and black sesame seeds. Add a squeeze of lime if you’d like, or some red pepper or siracha. Whatever makes your mouth happiest. Serve hot and enjoy! I recently found your awesome blog through instagram. I am totally loving everything about A House in the Hills. I really empathized with your struggle with Crohn's. I am similar in that I am finding ways through eating right to take care of myself as well. In any event, I'm a fan, and I look forward to future posts! 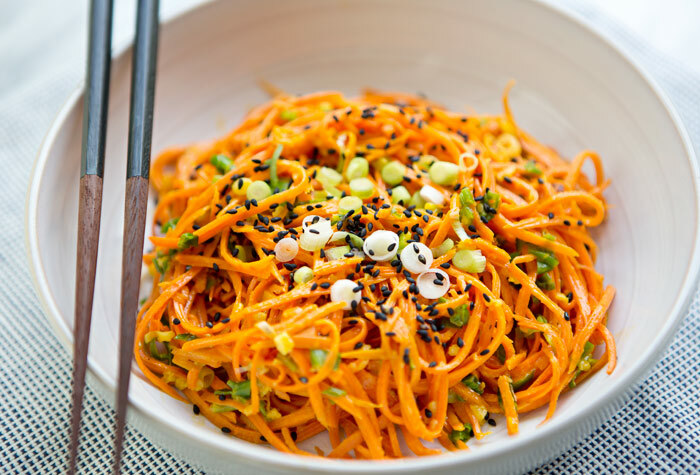 This looks like the greatest carrot salad ever, crossed with satay, crossed with noodles! So that's three times the win! Hi, this recipe looks delicious, I'm going to try it tomorrow night, I was just wondering how many serves is this for? Thank you. Yes, please post serving size. Is this for one person or two? This does look delicious but a recipe analyzer I use counts just over 3,000 calories for the whole recipe. I was wondering how many servings this produces. I am responding to the comment about this topping out at just under 3000 calories. In my estimation, this entire recipes would be more likely to total about 600-700 calories. Not sure where Mike Persin is coming up with those calories, but i’d sure like to see them itemized. Carrots are about 20 calories each, and the fats used should be not more than about 100 calories per TBS. So that would be about 500. The additional ingredients don’t seem to add up to much more than another incidental 100-200 calories, max. Please enlighten as to where you come up with 3000? This seems like a very low calorie and highly satisfying meal for two. I hope to try it tonight. Can’t wait! Thanks so much for the recipe! Where did you get that fab salt/pepper tray with spoon? 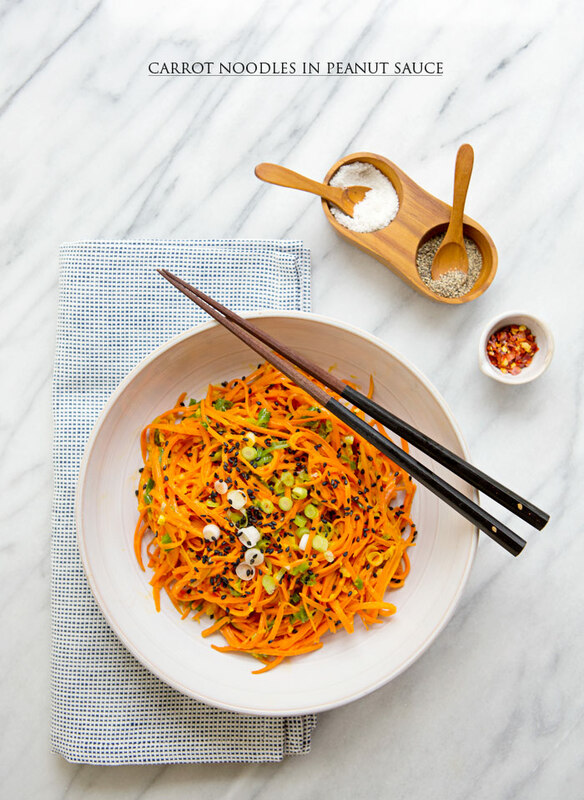 Beautiful photos and love the idea of using carrots as noodles! Made it for dinner tonite….Deelish!! Thanks. We love that wooden S/P dish! I found it at SFmoma. The noodles look delicious, but I LOVE that little salt and pepper holder. This sounds delish! Is this 1 serving? I sent the link to this recipe to my husband yesterday with the subject line "Dinner?" After putting our son to bed I went out for a run and when I returned home… voila! It was so delicious – thank you! Do you add the sauce to the pan or add it to the serving bowl after you remove from the carrots from the heat? Hi there! Love love love noodles too! But I can't use peanut sauce, my cholesterol… grrr… so is there any other alternative option to use? Thank you! kind regards from Spain! I can't thank you enough for this recipe! I made it three days in a row and expect to turn into a carrot myself anytime soon. 😉 Seriously, it's the best! I’m sold. I just bought a julienne peeler this very second! I made a gorgeous carrot salad with rainbow carrots the other day, but the flavors were a flop. So glad I came across this! I think I can save my salad! PLEASE OH PLEASE make the print more visible on your site! the eyestrain is NOT worth it. Gorgeous gorgeous gorgeous! nice to meet you btw!! And thanks so much for the inspiration for my lunch this weekend! !